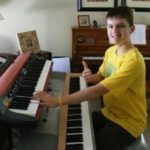 Brain Injury leaves 14 year old award winning musical sensation paralyzed on his right side. Can a Brain Injury and a headline like that possibly be a success story? I'd like to share this story with you. 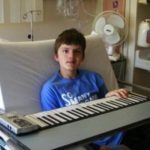 Watch this brain injury student playing piano and iPad (at the same time I might add), to create his own success story. (Video Below) He happened to be my student and it is a different kind of success story. Meet Connor Derraugh. He plays piano plus 5 other instruments, has recorded 2 CD's, has composed numerous pieces, plays in his own band AND he sings. A teacher's "dream student"! Connor is a SUCCESS story. June 8, 2010 was to be Connor's Gr. 8 Piano Exam. 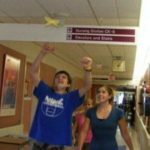 Two days after Connor's 14th birthday, (May 9, 2010), he went into the hospital for routine day surgery. I was expecting him the next day for his piano lesson in preparation for his exam in a few weeks. Then I got a phone call from his parents that changed everything. Something went horribly wrong during surgery which resulted in a brain injury - 2 brain hemorrhages; a stroke. He was paralyzed on the right side of his body. Would he ever play the piano again? Brain Injury Success #1 - Connor played with his left hand. Connor's parents brought his keyboard to the hospital. His right hand lay still on his lap while only his left hand could barely recall the keys he had so effortlessly played only a few days ago. His Grade 8 piano exam would not be completed in the weeks ahead, even though I knew he would have passed with First Class Honors with Distinction. Brain Injury Success #2 - Connor reached those butterflies. After a month in the hospital, Connor had to learn to walk again, one step at a time. Raising his right arm was the greatest challenge of all. Everyday increasing his walking distance, wishing he could do one more lap and maybe reach those butterflies. Finally the day came. Connor reached those butterflies. Something that seemed so simply, brought such joy of accomplishment. Brain Injury Success #3 - Connor begins to play again. Finally, Connor got to go home and open his still unwrapped birthday gift, a new keyboard. He was finally going to start to play his beloved music again. His journey back would be a very long and slow one, and one that required patience, encouragement and vision of all that is possible. 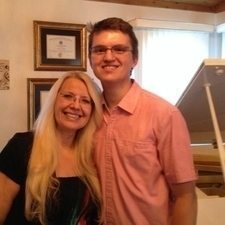 Connor was still my "dream student" because of his zest for life and great PMA - Positive Mental Attitude. Brain Injury Success # 3 - Connor played with his right hand. Eight months later... 2011. Connor slowly began to use his right hand. Because of Connor’s amazing parents, (Jeff and Lori), his family, teachers and friends, Connor continued to slowly make progress. I wanted to share with you an email I received from Jeff (Connor's dad). “Hi Glory, I have been reading ‘This is Your Brain on Music’, I was curious to see what it was all about and truth be known, I couldn’t put it down. It’s by Dr. Daniel J. Levitin, a former session musician and record producer who became interested in the inner workings of the human brain as it relates to music. As Levitin states, the common belief used to be that the right side of the brain (Connor’s unaffected side) was the mind’s music center, but now the thought is that the entire brain is involved in playing, creating, and even appreciating music. Listening to music coordinates more disparate parts of the brain than almost anything else – and playing music uses even more! According to the author not only does listening to music ‘cause a cascade of brain regions to become activated’ but when people listen to music dopamine is released in the brain, and dopamine as you may know means pleasure. ‘Music is clearly a means for improving people’s moods.’ Perhaps that explains the change we see in Connor when he plays music. Brain Injury Success # 4 - Connor performed with the band. The University of Manitoba Jazz Program faculty head honcho Steve Kirby asked Connor if he'd like to sit in with the staff and students in a get together to jam. Connor lumbered up to the keyboard, his jaw thrust high, his right hand held awkwardly at his side and sat down. Once his hands touched the keys however, Connor was all business, right into the music, moving his body to the Stevie Wonder classic ‘Living For the City’ in a euphoric state of bliss, communicating to the other musicians jazz cat style with knowing nods and gestures. 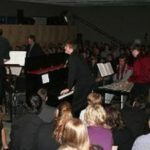 Connor took the piano solo and as per his adapted style, pulled it off with his right hand dangling by his side as his left hand rocked its way up and down the keyboard. 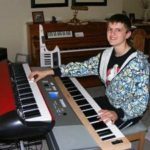 Brain Injury Success # 5 - Connor playing piano and iPad. As of June 2014, Connor's journey still continues. Three years after his surgery Connor returned to complete his Grade 8 piano. He has spent many hours with his left hand restrained so he would be forced to concentrate on his right hand. Getting bored with nothing to do with his left hand, he came up with a plan. Watch Connor - My Brain Injury Student, as he is playing piano and playing an iPad game - at the same time. What is the meaning of Success? As music educators we strive for excellence. We want high marks in examinations, awards at music festivals, recognition of accomplishments through various scholarships and whatever else we can find to show our parents, teachers, students and friends how much success we really have! Well for my "dream student" Connor, success was simply learning to move his left hand, and then his right hand across the piano keys so he could get back to playing the piano and iPad at the same time. P.S. What is your greatest inspiration or success story? Please share it below.